The sixteenth century in Europe was a time of unprecedented change. It was the beginning of the modern era, and it saw a revolution in almost every aspect of European life. The century opened with the discovery of a new continent. The renaissance in Italy was peaking and spreading north, even arriving in backwaters like England (Hale – The Civilization of Europe in the Renaissance). Life was largely prosperous for the average person, the economy was growing. The mechanisms of commerce, systems of international finance, ocean-going trading fleets, an entrepreneurial bourgeoisie, were all building a recognizably capitalist, money-based economy. Geniuses were stepping all over each other on the street corners producing scientific innovation after innovation. Technological innovations like gunpowder were changing the nature of warfare and the military caste nature of society — the cannon probably had a great deal to do with the rise of the centralized nation state as we know it. The printing press created a media revolution. It brought ideas, partisan rhetoric, and how-to manuals to the people. Most of all, it brought the Bible, in its original tongues and in the vernacular, to the masses. A spirit of inquiry, a desire to return to first principles, was blowing through the Church, which had been the unifying cultural foundation of Europe for a millenium. Consequently, the castles and land ownership by the Irish Clans was ephemeral with the exception of a few. The theory of a solid Irish party fighting against a solid English party was never true at any time in Ireland. It was least of all true during the Munster and Ulster rebellions, even what was professedly a war of religion during the 16th century. The country was divided by its people as well as by difference in status. By the end of the Renaissance period England had become the dominant ruling country in the world. 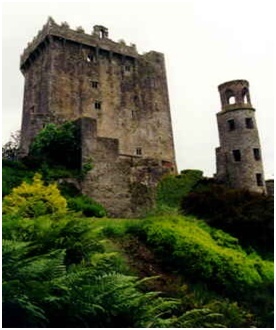 Blarney Castle: Blarney Castle, the famous Blarney Stone and Blarney terrain as viewed by the visitor today: The Castle is the third to have been erected on this site. The lower walls are fifteen feet, built with an angle tower by the McCarthys of Muskerry. It was subsequently occupied at one time by Cormac McCarthy, King of Munster, who is said to have supplied four thousand men from Munster to supplement the forces of Robert the Bruce at the battle of Bannockburn in 1314. Legend has it that the latter king gave half of the Stone of Scone to McCarthy in gratitude. This, now known as the Blarney Stone, was incorporated in the battlements where it can now be kissed. The first building in the tenth century was a wooden structure. Around 1210 A.D. this was replaced by a stone structure which had the entrance some twenty feet above the ground on the north face. This building was demolished for foundations. In 1446 the third castle was built by Dermot McCarthy, King of Munster of which the keep still remains standing. The Earl of Leicester was commanded by Queen Elizabeth I to take possession of the castle. Whenever he endeavoured to negotiate the matter McCarthy always suggested a banquet or some other form of delay, so that when the queen asked for progress reports a long missive was sent, at the end of which the castle remained untaken. The queen was said to be so irritated that she remarked that the earl’s reports were all ‘Blarney’. The castle was besieged during the Irish Confederate Wars and was seized in 1646 by Parliamentarian forces under Lord Broghill. However after the Restoration the castle was restored to Donough MacCarty, who was made 1st Earl of Clancarty. During the Williamite War in Ireland in the 1690s, the then 4th Earl of Clancarty (also named Donough MacCarty) was captured and his lands (including Blarney Castle) were confiscated by the Williamites. The castle was sold and changed hands a number of times before being purchased in the early 1700s by Sir James St. John Jefferyes, then Governor of Cork City.Members of the Jefferyes family would later build a mansion near the keep. This house was destroyed by fire however, and in 1874 a replacement baronial mansion – known as Blarney House – was built overlooking the nearby lake. In the mid 19th Century the Jefferyes and Colthurst families were joined by marriage, and the Colthurst family still occupy the demesne. In the early 20th century when Irish estates were being bought up by the British government Sir Geo C Colhurst owned 31,260 acres of varying quality land.